The Miami-Dade County Courthouse is one of the coolest buildings in Miami, mainly because it has a slightly gothic thing going on (though it is actually classified as a neo-classical structure with elements of Art Deco). 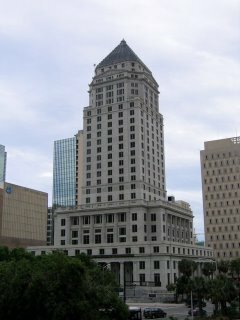 It served as Miami City Hall for a short while and it is actually listed in the registry of historic places since 1989. Personally, I like it because it has a somewhat medieval air to it. (In observance of the Jewish holiday of Shavuot, I am posting this on 6/1/06 and postdating it to the correct date).